I have absolutely zero doubt that if someone asked me what book this year had the strongest impact on me...left me in emotional turmoil and wondering what's out there...what the future of humanity looks like...it would be this book. I told my buddy read friends that I'd write a review for this one when I could find the words because I think this one of all the books I've ever read and I promise there are a few, but this is the one that defies explanation. This is not a romance story but it's a story that's filled with love so much love and fear and arrogance...so much arrogance. It's the arrogance of humanity and to be honest it's what scares me the most and probably the reason that I find SciFi to be one of the most disturbing genre's to read, but I'll babble about this a little more later. 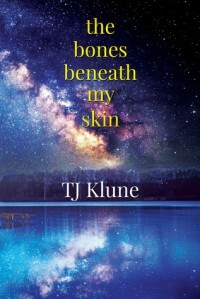 'The Bones Beneath My Skin' is the story of Nate Cartwright a man who finds himself at a crossroads in his life. Alex a man standing at his own crossroads and with a mission that he's determined to see through no matter what the cost and Artemis Darth Vader, a little girl whose future is bigger than anyone could ever imagine. But all of this is smoke an mirrors for what lies at the heart of this book because at the heart of it is humanity and that's what threads throughout this story is a story about man/womankind and while it's ultimately a story that gives hope it balances on a knife's edge and shows a world that can go either way...a world that can hold hope and love or one that's fueled by fear and arrogance...the choice is ours. One of the things that I've come to realize about TJ is that he's not an author who sticks to any one specific genre and each time he steps outside of a box he gives his unique touch to a story and while it may not be the signature TJ Klune that we got in previous stories it still bears his signature in it's own way and each story offers it's own emotional roller coaster ride and often leaves me with things to ponder and in this case what I was left pondering was the question of how mankind/womankind/humanity whatever term you want to use got to be so arrogant. How did we ever come to the conclusion that we're the only life form in this galaxy or any other that's viable and intelligent, capable of emotion, able to form civilizations, cultures, to care for each other, capable of technological advancements and so many other things...where did this arrogance come from and when will we realize that it's a very strong and realistic thought that we're not alone in all the expanse of planets in this universe and those beyond the possible lifeforms could be unlimited...it's a scary thought because some may be good, some may not but if we shoot first and ask questions later we'll never know. I'm not sure what I was expecting going into this book...other than a story that I would enjoy and be engaged with, a story that would make me think, question my values and beliefs and as always with this book by this author I got all that. I was entertained, there were characters that I really related to and I'm still thinking and weighing my values and beliefs...savoring the subtle, small moments that helped to make this story so strong and memorable. when it comes to buddy reads for me, I think this might have been the buddy read that sets the benchmark for all that follow...It was a 5 stars read with 5 star buddies. Big thank yous to Josy and Simone who took this adventure with me as always it was all kinds of epic and awesome!! !